Q: What do you believe happens to someone after they die? Like ... are they just gone and finished, or do they move on to some further kind of life, or are you not sure? A: I would say I am agnostic but optimistic. I think it is impossible to know for sure whether a person has a soul or spirit or essence that continues after their physical body dies, but I am moderately hopeful that something of the person goes on. I believe it is one of the great mysteries, and one day we will each of us learn the answer, because we will all die. Q: If you hopeful that there might be something there after you die? What do you hope for? A: Yes, I am hopeful. I am a pagan (Wiccan). Many Wiccans believe in reincarnation – that our spirits or souls have been embodied as other people or animals before and that after our current physical bodies die we will be reborn as other beings. In some ways this is similar to the way the physical elements that make up our bodies become parts of other things after we die. I hope this is so, but have no definite proof of it. Sometimes I think that the spirits of those who have passed away linger to watch over their relatives and loved ones, at least for a while. Or perhaps they are so connected to a place or an incident that they linger because it is hard to give up that connection. Whether there is some Otherworld that the spirits go to is also a possibility I entertain. Perhaps this is a place of rest between incarnations, or perhaps it is a place we go to when our spirits are ready. Perhaps that is like the escape from Samsara or enlightenment or some sort of heaven, but those concept are probably poor approximations of the best guesses people have made. As I said, it is life’s great mystery. Q: If you believe there might be an afterlife, is this quality of the afterlife affected by the way you lived your life? Or do your actions in this life have little consequence? A: Again, I’m not sure, but I do suspect that if there is an afterlife, the way we live or the way we die may have some effect on it. For example, if one believes in ghosts, then the legends suggest that ghosts tend to haunt the places that people lived or died. This would imply that a person’s spirit might for a while remain attached to something that was important to them during life. Also, I think it is possible that the afterlife – whether that is reincarnation or travel to some Otherworld – is affected by what we did and what we learnt on the material plane, our mortal lives. I do not know if we get to choose where we go or what our next incarnation may be, but perhaps we do. It would be nice to think that maybe we could meet up with those we have loved but who have passed on. I do not know how much is chance, how much is choice, how much is a learning experience chosen for us by some guiding force. Perhaps it is a mixture of all three or perhaps it is none of these. Q: Do you believe that religious faith or forgiveness is required to have this afterlife? A: If our souls are reincarnated, then that probably happens whether they believed it or not. However, it is possible that what a person believes will affect their afterlife. Perhaps if they strongly desire to remain as a guardian spirit for a loved one until it is that person’s turn to die, then they will get their desire. If they strongly desire to be reincarnated into the same family, maybe that will happen too. Q: Have you had a particular experience that has affected your belief in the afterlife? This might have happened to you, or someone close to you. (e.g. NDE, experiencing presence of a loved one, past-life therapy) Can you please describe this to me? A: Yes, I have felt the presence of spirits – or believed that I might possibly have done so. After my mother died, I would continue to chat to her, beside her favourite armchair, and could often feel that I sensed her spirit and communicate with her a little. It might have been imagination or wishful thinking of course. I also took part in a “journey” to the underworld to communicate with the spirits of the dead. It felt as though I communicated with my mother’s spirit, but again could have been just my imagination. I don’t like to get carried away with wishful thinking and prefer to remain a little sceptical. Q: Have you read any book or seen a TV show or movie or heard someone talking that has helped you understand what will happen to you after you die? A: I’ve read and discussed these subjects very widely, which is probably why I am agnostic. Those people who say they know there is life after death or who say they know there is no life after death never seem to have absolute proof, just circumstantial evidence and strong belief. Q: Has your belief changed across the course of your life? A: Yes, it has changed. I was raised as a Catholic so as a small child I completely believed in heaven and hell and that those who believed in God and lived good lives went to Heaven. My Grandma was a Theosophist, however, and she believed in reincarnation. When I was about 6 or 7 I asked her why different people believed different things and she replied that we each have our own path. They might be different paths and we must all follow our own path because it is the right one for us. That is what I still believe. Even atheists are following their own path, and that is the right path for them. Sometimes our paths take us through different beliefs and understandings, which is fine as each path is a journey of discovery and learning. I also think that it is natural that small children have a more simplistic view of everything and believe what they are taught. As we get older we start to question things and come into contact with other points of view. A: They are entitled to their belief. Everyone has their own path to follow. Q: What is your opinion about people who maintain a belief reincarnation? How might you respond to someone who expresses that belief? A: They are entitled to their belief. Everyone has their own path to follow. I would also respond that I am very sympathetic to the theory of reincarnation and am hopeful that it happens. It is a theory that many pagans believe in. Q: As an adult, has your belief about the afterlife been of any comfort to you when you have been at a funeral, or when confronted with the death of a person or thing that you have loved? A: Yes, I believe there is always hope, and that is a comfort. Q: Do you ever think about the fact that one day you will die? What do you think about? A: Yes. Of course I consider my own death – more so as I get older and certainly after the death of my mother. I have a mixture of sadness and curiosity. I love my life and don’t want it to end, but I am curious as to what comes next and I know that when I die I will find out. Q: Are you afraid of dying? (If yes) What are you afraid of? (If not afraid) Why are you not afraid? A: I am certainly afraid of pain and suffering. I am afraid of dying in some unpleasant way – and let’s face it, there are few pleasant ways to die although some are quick and some are slow. I believe that if death comes at the end of a long and happy life, but when a person’s body is starting to fail them then death can be a release from suffering. I am afraid of dying too young and too unpleasantly. I am not afraid of death if it comes when I am very old, but comes quickly and painlessly. Q: When you die, how will the memory of you live on? (Things you have achieved, memories of your family and friends, monuments) Do you care if you are remembered? A: I hope my blog (www.badwitch.co.uk) and my other writing keeps my memory alive. I would like to be remembered for my writing. A: Yes, though rather unconventional. My father was a Catholic and I was raised as a Catholic, but my grandma was a Theosophist, my mother was an agnostic, my cousins followed the Baha’i faith while other family members ranged from Protestants to atheists. I learnt that one should be tolerant of each other’s beliefs. 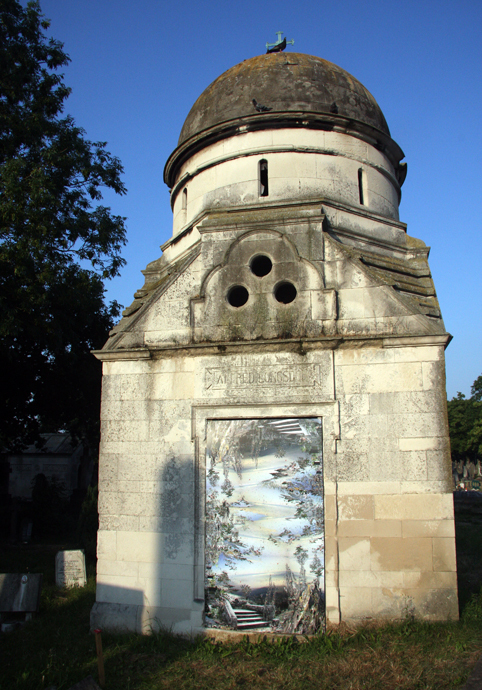 The image at the top shows a trompe l'oeil showing a portal to an imaginary world on a mausoleum in West Norwood Cemetery. It is by Jane Ward. Great post (as always) thank you very much .